NEW BRITAIN - When Steve Villanti spoke in front of Central Connecticut State athletes, faculty and alumni, among others, he was in a familiar place. Villanti has been the associate athletic director for external services at the university since 2009 and before that served as an assistant football coach at the school from 1985 to 2001. 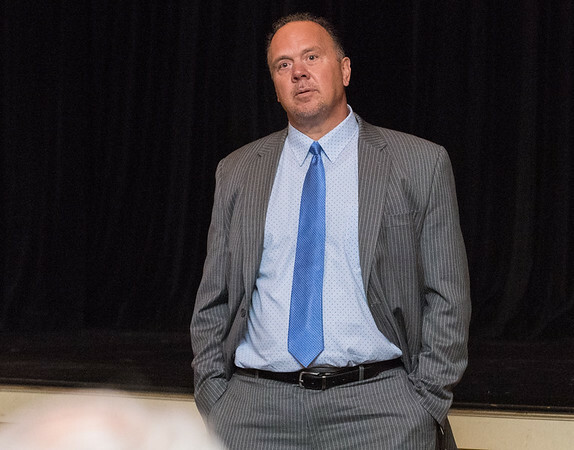 Before Villanti got into his pitch on why he should be the next athletic director at the university, Villanti wanted to thank those in attendance. As Villanti continued on, he touched on the history and tradition of CCSU athletics and how he’ll prioritize that should he get the job. Villanti mentioned that in order to deal with budget constraints, it’s going to take a collective effort and he can’t do it alone. He didn’t touch as much on the budget issues as the prior two candidates did in the public forum. Some of the other subjects Villanti responded to included diversity and gender equity of the school and recruiting issues at the school. As far as diversity and gender equity, Villanti had evidence to show the university was ahead of the average school. Villanti also mentioned that he adopted two Filipino kids years ago and now has two grandchildren that are half Filipino and half Puerto Rican, so diversity is important to him and has been. As far as recruiting and bringing the right athletes to CCSU, Villanti said the school has to improve in that facet. Posted in New Britain Herald, CCSU on Friday, 22 June 2018 20:16. Updated: Friday, 22 June 2018 20:18.